When the folks at Guinness invited us to join them in Ann Arbor, Michigan for the weekend to drink some beer and watch Manchester United and Real Madrid battle it out at The Big House, we couldn’t decline. After all, how often do you get the opportunity to see two of the biggest soccer clubs in the world compete live, let alone on U.S. soil? For most people, it’s a once in a lifetime experience, and with United absent from this year’s UEFA Champions League, the chances that fans will ever see Wayne Rooney and Cristiano Ronaldo share the stage again seems pretty unlikely. So as the resident soccer fan on staff, I flew out to Detroit on Friday to meet up with fellow bloggers from sites like Made Man, Bleacher Report, Inside Hook and World Soccer Talk. After quickly checking into my room at the MGM Grand Hotel, I joined the rest of the group as we boarded a van headed for the home of the Michigan Wolverines to watch Manchester United and Real Madrid’s open training sessions. Both teams appeared to be relaxed but focused on the night leading up to the big game, engaging in the usual fitness drills and rounds of keep-away, while a few of the players even tried their hand at some football of the American variety by tossing the pigskin around with University of Michigan quarterback Devin Gardner. Of course, it was all just a tease for the real festivities on Saturday, which began with miles of traffic on I-94 as tens of thousands of soccer fans flooded the college town of Ann Arbor for the big game. Thanks to some creative detouring by our driver, we arrived in plenty of time to enjoy a cold pint at the Guinness beer garden, who, as the main sponsors of the International Champions Cup, were allowed to serve alcohol inside the usually “dry” stadium, a rarity for the university and college sports in general. While hanging out enjoying our dark brews, the group spent the next hour discussing predictions for the game and watching the massive crowds as they made their way into the stadium. And if the 2014 World Cup wasn’t evidence enough that soccer is very much alive in the U.S., then the numerous fans seen wearing jerseys from all over the world confirmed it. Most of the jerseys represented were from the two clubs playing, and the Manchester United fans easily outnumbered those cheering on Real Madrid, but the Spanish club still had its share of support, with several James Rodriguez shirts spotted despite the fact that the Columbian superstar (and recent Golden Boot winner) didn’t even make the trip. But it was nothing compared to the United fans, who created a sea of red in The Big House that, while it was certainly a remarkable sight to be seen, is an image that University of Michigan students will never want to see again in light of their rivalry with Ohio State. The game itself was entertaining, despite being played at a preseason pace, with United proving the more dangerous of the two. The Red Devils ended up winning the match 3-1 in a manner that should help fans forget about the short-lived David Moyes era, although it should be said that while Louis Van Gaal had most of his players available for selection (save for Robin van Persie), Real Madrid manager Carlo Ancelotti was missing key players like Rodriguez, Toni Kroos and Karim Benzema. Even Ronaldo himself wasn’t scheduled to participate, but in the biggest surprise of the afternoon, the Portugese attacker made a brief cameo towards the end, earning the largest applause of the day as the stadium erupted upon his entrance into the game. Saturday’s match-up was a pretty big deal on its own, however, the day was made even more significant by setting a new record for the largest attendance at a soccer event in the United States with an incredible 109,318 fans. It’s not every day that you get to be a part of history, but to do so while watching some of the greatest soccer players in the world is one that not a single of those 109,318 people will ever forget. 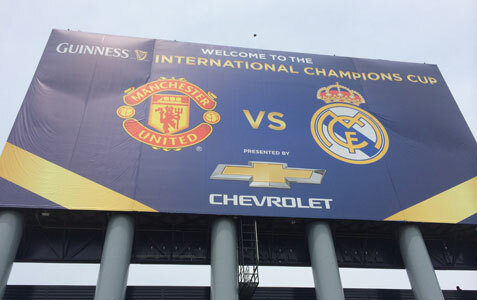 For more information on the 2014 Guinness International Champions Cup, which wraps up action later tonight in the final between Premier League rivals Manchester United and Liverpool, check out the official site, and be sure to follow Guinness at their new American-specific Twitter account @GuinnessUS.